Learning how to fall is a trial and error business. For beginners in Aikido taking falls is a very scary part of early training. 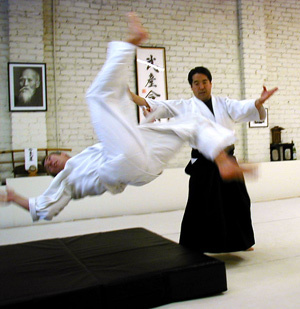 In America the art of taking techniques (falls), or ukemi, is generally given more emphasis than it had been traditionally at the old Iwama Dojo in Japan. In many American dojos there are classes devoted to teaching students how to fall, how to do forward and backward shoulder rolls, chest falls, and how to do those flying breakfalls, or tobu ukemi. While the beneficial result of this focus on falling is that fewer people probably get hurt, some older Senseis scorn these ukemi training classes. They say, ruefully, that in America the emphasis in Aikido has shifted from learning to do proper techniques to learning how to take spectacular falls. "It's all about ukemi and not good technique," I once heard Tatoian Sensei growl. 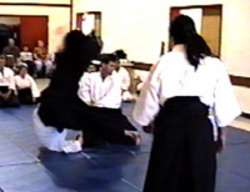 In Japan, according to Goto Sensei, Saito Sensei didn't emphasize falling at the Iwama Dojo, but trusted that students would learn how their bodies should crumple from having techniques performed upon them. The better the technique, the better the opportunity to learn the fall. In my opinion, this more traditional Japanese approach isn't quite right for American students, many of whom are much older and maybe more brittle than the young Japanese and American men and women who trained at Iwama during Aikido's early days. On the other hand, I agree with Tatoian Sensei that Aikido shouldn't be about falling, but about good technique. So where is the middle ground? One part of the solution, for me, would be to offer enough falling practice to forestall experimentation. American students, even some older ones, are impatient, and they want to learn as much as they can as fast as they can. Generally, this attitude is incompatible with Aikido, in which achieving proficiency takes so long. But among kyu-ranked students, and even some shodans, the rush to improve is a prevalent theme. These students, especially those over 40, can become seriously injured experimenting with falls, especially breakfalls. I know this because I was one of them. A month before my shodan test I took a breakfall out of a forceful kokyu-nage, augured over onto my right shoulder, and shattered part of the joint between my collarbone and shoulder. This nasty incident was the result of my laziness and indecision in commiting to the fall, my hazy understanding of how to do it, and the shocked hesitation that gripped nage, who wasn't expecting me to fly. All these factors added up to a very ugly fall, an experiment that failed completely. Both Tatoian Sensei and Goto Sensei make extra effort to show new students how to move into the pain with techniques like Nikkyo and Kote-Gaishi, thus protecting themselves when the reflexive impulse is to pull away. Ukemi disasters can also take the form of unfortunante accidents, such as the time during Craig's Nidan test a couple of years ago when, during randori, he rolled me across the mat into the wall mirror. It didn't break, but only by dumb luck. That's the sequence in the picture just before I hit the glass. Goto Sensei advises that a good way to avoid injury in taking falls is to give spirited, authentic attacks. Half-hearted, uncommitted attacks are much more likely to end in disaster than true attacks. During the half-way attacks everyone, uke and nage, are trying to compensate on the fly. This often results in bad technique, bad ukemi, and peoiple getting hurt. For me injury was the pathway to common sense about learning to fall. You'd think that someone over 50, as I was when I took my shodan test pretty much left-handed, would already be more sophisticated, but it wasn't the case. More recently, slowing down my ambitions and settling in more patiently as an Aikido student helped some too. Now the only times I seem to get hurt are when I'm messing around, but that's another subject isn't it? We serve our country, we can not all use the same way, each person should be in accordance with the intrinsic data, whatever. Hola, amic Ferran. Com be t'expliquen dalt, en el llistat d'escoles estc3a0 quasi tota la inmcrfaoic3b3 que cal (menys el preu, jeje).De tota manera, si vols, envia'ns un email ag a n d i a @ a i k i d o v a l e n c i a . e si et contem tot el que et siga precc3ads. Ok. The second part (Throwing/joint mauianlption)? Yes. Both arts train HEAVILY in those from the get go.You will learn some basic defense techniques against punches, and progress with them. Being able to use them in sparring, however, would depend on the school. I would assume Bujinkan would be the same, but I don't know. Mutual respect ceeatrd in this way has such a natural rhythm to it, doesn't it? I was just discussing this topic with my 13 year old yesterday - and how nice it would be if the students and staff at his public school had more opportunity to build relationships like this, relationships built from respect. The blog you link to is fantastic. Thanks for sharing it!